Living matter possesses remarkable material properties, such as the ability to sense the environment, make decisions based on sensory input, and through self-propulsion, move in the direction of choice. The simplest single cellular organism, the bacterium, possesses these properties, as do many multi-cellular organisms. Some bacteria and amoeba, such as Dictyostelium exhibit chemotaxis – or navigate along chemical gradients to forage for food. In other circumstances, such as starvation, individual Dictyostelium communicate with each other through a chemical reaction-diffusion mechanism and self-organize into a kind of tissue where the single cells aggregate into a fruiting body for survival. Some bacteria aggregate and then protect themselves by enveloping themselves in a starch coat called a bio-film. These materials have the ability to heal themselves. The goal of this project is to create a new class of materials, which have properties heretofore only associated with living matter. Like living matter, these materials will be active in the sense that they must consume energy in order to function, but will be entirely synthetic with no biological components at all. Combining methods of experiment, simulation and theory and personnel spanning the disciplines of neuroscience, computer science, physics and chemistry we will lay the scientific framework to create materials that have properties like trees that grow thicker and stronger in response to stress imposed by wind or snow, or muscle tissue, which increases strength in response to exercise. The materials we will study are based on the Belousov-Zhabotinsky (BZ) chemical reaction. The BZ system produces an oscillating redox reaction of a metal ion . In thermodynamically closed systems the BZ oscillations can occur 100 times, but will last forever in an open system in which the BZ reactants are continuously fed into the solution. In analogy with living matter, we produce “cells” by isolating the aqueous BZ reagents in either gels or in emulsion droplets where oil forms the continuous phase. We combine individual cells to create a “tissue” composed of many cells separated by a matrix or fluid. Cells communicate through the diffusion of BZ chemicals through the intervening medium. 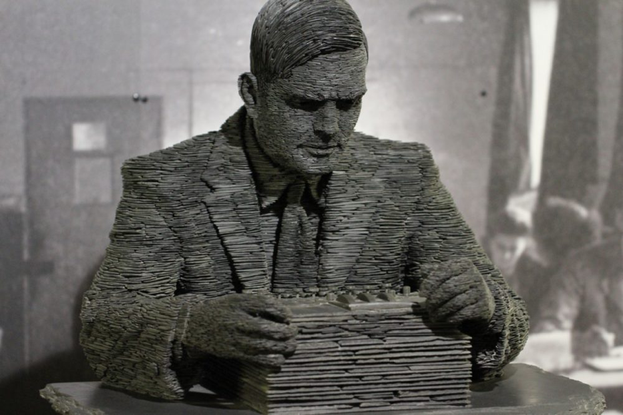 Meghna Chakrabarti of RadioBoston on WBUR (Boston's NPR news station) interviewed Seth and Irv about the lab's experimental confirmation of Alan Turing's theory of morphogenesis. Link to RadioBoston interview webpage. Animated histogram displayed with a nonlinear timescale (time bar in right panel). Drops demonstrating morphogenesis plotted as fraction of original drop area vs. fraction of original drop intensity. The color coded line tracks the center of each peak as a function of time. Drops are initially homogenous in both intensity and size. Bright drops are oxidized, dark drops reduced. At intermediate times the drops undergo a Turing case (d) instability; heterogeneous in intensity, or oxidation state, but homogenous in size. This is equivalent to chemical, but not physical differentiation. At later times drops are heterogeneous in both oxidation state and size, i.e. chemical differentiation precedes morphogenesis. The oxidized (bright) drops shrink and reduced (dark) drops swell. Chemical conditions: 200mM MA, 0.4mM Rubipy, 0mM NaBr, 80mM H2SO4, 300mM NaBrO3, 3mM Ferroin, 0.05 x 1mm capillary, initial drop size ∼ 66μm. Nathan Tompkins, Ning Li, Camille Girabawe, Michael Heymann, G. Bard Ermentrout, Irving R. Epstein, and Seth Fraden, Proceedings of the National Academy of Sciences 111, 4397–4402 (2014). The BZ chemistry is complex, but can be understood semi-quantitatively at a detailed level involving a few dozen chemical species. Focusing on the rate limiting reactions allows a simplified description in terms of two species; an activator and an inhibitor, which interact in three distinct steps. First, the metal ion is in the reduced state. The inhibitor suppresses oxidation of the metal ion while a slow process consumes the inhibitor. Second, once the inhibitor falls below a critical threshold, the activator is unleashed and an autocatylic reaction leads to a rapid oxidation transition consuming all the reduced metal ion. Third, once the oxidation is complete a slow process reduces the oxidized metal ion while simultaneously producing the inhibitor, thus restarting the oscillation. A limited subset of the aqueous BZ chemicals permeates through the hydrophobic intercellular medium giving rise to intercellular communication. In the video above, the 7 drops in a ring are inhibitory coupled. Each drop acts to inhibit its immediate neighbor. But frustration arises because there are an odd number of drops in the ring leading to the generation of a beautiful heptagram. Videos: Nate Tompkins. FradenLab YouTube. Inhibitory coupled BZ drops adopt a spatiotemporal pattern such that neighbors oscillate with the largest possible phase difference. (Left) Real space. Video of oscillations in a ring of 7 BZ drops. Colors label each drop. Flashes occur when a drop oxidizes. (Right) Phase difference space. Location of colored disks on circle represents phase difference between drops at the moment of the oscillation. The white disk rotates at the average oscillation frequency. The white disk crosses a colored disk when the corresponding colored drop oxidizes in the left video frame. The maximal phase difference between neighboring drops is 3pi/7 and 4pi/7; e.g. in the left video frame the red drop has a mauve and orange drop as nearest neighbors, but in the right video frame the mauve and orange colored disks appear as opposite as possible from the red disk at positions representing phase differences of 3pi/7 and 4pi/7, as Turing theoretically predicted. Videos: Nate Tompkins. FradenLab YouTube. We also introduce light sensitive catalysts that allow external control of the reaction. We fabricate cells between 10 microns and 200 microns in diameter. Using a computer programmable illumination system we can individually “address” each cell and control the phase of the chemical oscillator using light. When confined to a two dimensional layer we can simultaneously image and control about 1000 cells. Chaos 25, 064611 (2015); DOI: 10.1063/1.4922056. Eur. Phys. J. E 38, 18 (2015); DOI 10.1140/epje/i2015-15018-3. Phys. Chem. Chem. Phys. 16, 10965-10978 (2014); DOI:10.1039/C4CP00957F. PNAS 111, 4397–4402 (2014); DOI: 10.1073/pnas.1322005111. Soft Matter 7, 3155 (2011), DOI: 10.1039/c0sm01240h.